The weather and the schedule have messed up my plans for writing previews this week… I was going to cover two matches tonight but the second round matches in question have yet to be completed! It has just been confirmed that Middle Sunday will have play this year so it’s going to be a wild few days at Wimbledon. Here’s hoping that the weather actually decides to co-operate because it’s been just dreadful for the past two Slams. Here’s two quick previews for Keys-Cornet and Lisicki-Shvedova which should be scheduled for Saturday. When the draw came out, it was Madison Keys’s potential second rounder that looked to be a stumbling block. Keys went up against former Wimbledon semi-finalist, Kirsten Flipkens and survived, prevailing in three sets and overcoming a late wobble on serve to win, 6-4 4-6 6-3. I happened to drop into this match at the end of the second set and Keys was getting mega frustrated with errors flying off her racquet. The American produced a gutsy hold in the first game of the third set, staving off two break points to hold. Flipkens bounced her racquet, knowing that a great opportunity to break had passed. Keys then went onto win the next four games to go up 5-0 before eventually sealing the win in the decider, 6-3. Keys has been in great form this year, delivering a consistent slate of results pretty much across the board on all surfaces. The win in Birmingham, her second grass court title, was perfect preparation for Wimbledon and she seems to be in a good head space and ready for the challenges ahead. Title contender? I’d say yes. Keys plays Alizé Cornet, who is into the third round of Wimbledon for just the third time in her career. The Frenchwoman scrapped her way to a straight sets victory over Sara Errani, 7-6(4) 7-5. Don’t let the scoreline allude you, this was a gruelling match! Cornet needed over two hours to put away Errani but as you can imagine, she was delighted at the end. Errani had won four of their five previous encounters so even on the Italian’s weakest surface, it was an excellent win for Cornet. Keys beat Cornet in their only previous encounter, 6-2 6-4 in Cincy in 2014. The win over Flipkens was a big win for the American and I think she will have the measure of Cornet. The Frenchwoman can make life awkward but I think Keys has the power to hit through on grass and based on recent form, the consistency also, to prevail in straight sets. Sabine Lisicki and Yaroslava Shvedova will reignite their grass-court rivalry when they play in the third round on Saturday. The pair have played two nailbiters at Wimbledon; Lisicki won them both, winning at the 2012 Olympics in 4-6 6-3 7-5 (where she saved a match point) and then at Wimbledon in 2014, 6-3 3-6 6-4. Lisicki is down at #81 in the rankings and has had a miserable year; prior to reaching the third round of Wimbledon, Lisicki had won back-to-back matches just once in 2016. Lisicki has beaten Shelby Rogers (6-1 6-3) and Sam Stosur (6-4 6-2) so far this week at SW19. There’s something about this place that just seems to connect with Lisicki. In a way, it’s infuriating because it shows what she is really capable of and if only, IF ONLY (! ), there was a way of transferring her form at Wimbledon to other tournaments. In a Muguruza-less bottom half, I don’t think anyone would be surprised to see Lisicki have a deep run. Shvedova stands in the way for Lisicki and has previous form on the grass too. She played a stunning match against Serena Williams at Wimbledon back in 2012, losing out 7-5 in the third set. This was also the same year that Shvedova produced the golden set against Sara Errani in the third round. This year at Wimbledon Shvedova has secured two decent wins over Julia Goerges (7-5 6-4) and Elina Svitolina (6-2 3-6 6-4). 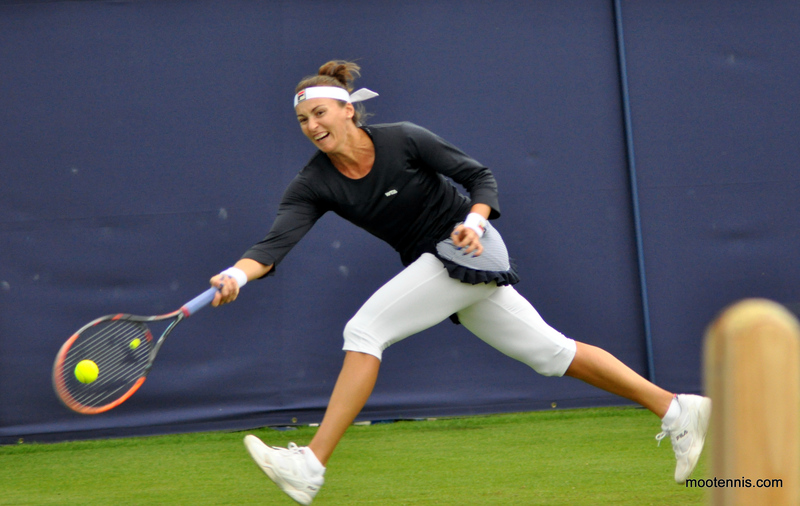 Like Lisicki, Shvedova came into this tournament on a barren run of form; she was on a seven match losing streak which she snapped in Eastbourne qualifying with a victory over Louisa Chirico. Shvedova won her last match against Lisicki, a wacky 0-6 7-5 6-4 victory in Brisbane. However taking into account that this is Wimbledon and also with a new coach in tow, Salvador Navarro, i’d fancy Lisicki to prevail in two tight sets. July 1, 2016 in Cornet, Keys, Lisicki, Shvedova, Wimbledon, WTA.